Pictures taken by Sarah Nebel Photography. She attended the Denver Publishing Institute in 2009 and has been a recruiter ever since. She is the Communications and Student Relationships Manager at The Iowa Writers’ House and one of two Directors of The Writers’ Rooms. She writes children’s poetry and stories for Whimsical Whiskers and volunteers at RARE, a raptor rescue center. When not volunteering and working, she’s writing her LGBT YA fantasy story, posting urban and regular fantasy on Wattpad, and sharing her literary journey on Instagram. She plans to release her first book, The Purple Door District, in December 2018. For more information, visit her website at www.erincasey.org. They say some writers have animal companions who inspire them when the muse takes a break. Meet the flock. Luna and Apollo: Silver and Tangerine Ringneck Doves (Bottom right)- Luna and Apollo were the first to join the flock back in November 2014. They taught me what it meant to be a bird mom and calmed my stress with their coos. Apollo tends to be more affectionate while Luna is the daredevil who dive bombs the room…and sometimes my head. Orion: Green Cheek Turquoise Conure (Bottom left)- Orion and I bonded the moment we saw each other in the pet store. I spent over an hour with him, and I couldn’t leave without him on June 20th, 2015. He’s my constant companion and likes to spend most nights perched on my computer while I write. When he’s not stealing my popcorn. He’s also “mated” to Nova. 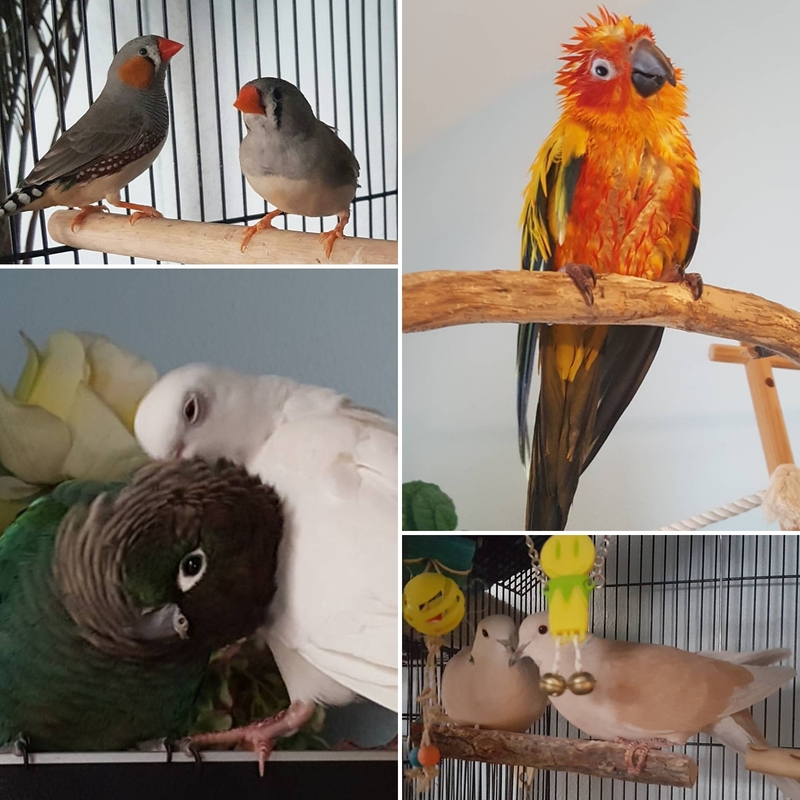 Nova: White Ringneck Dove (Bottom left)- Nova is a rescue. I got her from the humane society on October 20th, 2015, after her mate died and her previous owner got rid of her because she was “too much trouble.” She lived, nameless, for five years as part of a video project. When I met her, she was terrified of hands, could barely fly, and was skittish. Now, she sleeps on my arm, eats out of my hand, and cuddles with her new “mate” Orion. Venus and Zeus: Zebra Finches (Top left)- Venus and Zeus were actually part of a trio with their sister Athena. I rescued them in March, 2016, after a woman gave them up to a local store. Within a few months, Athena and Zeus hatches four precious baby birds. I had the pleasure of watching them grow and helped them find their forever homes. Sadly, Athena passed away near the end of 2016. Zeus and Venus are currently trying to repopulate the finch race themselves. Aladdin: Sun conure (Top right)- The baby of the family, Aladdin was stuck at a pet store for 10 months. At first he was a friendly little bird, but as time went on, he became aggressive due to abuse (both from customers and a worker). Fortunately, another worker took it upon herself to smother him with love. With her kindness, and his familiarity with me, I brought him home in January, 2017. He giggles, he plays, he bites, he cuddles…he’s a toddler with wings, and he lets you know it. Follow their story on their own instagram page here.